Hello! It's Monday morning. I'm getting caught up on a few things that we missed accomplishing over the weekend. I'm working on some scrapbooking projects, laundry, and housework. I'm trying to get things done so I can maybe get a little bit of downtime while the kids are taking naps. Friday was reveal day for Elle's Studio design team gallery. I have two projects to share today and then I'll have the third (a mini album) to share in a few days. 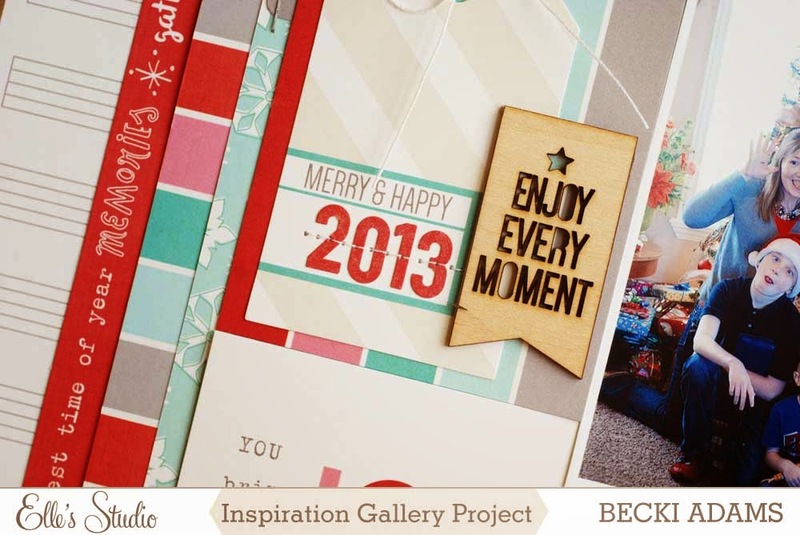 This month I worked Elle's two new collections (Sycamore Lane and Good Cheer). Both of these collections are in stock you can find them HERE. The wood veneer that goes with this collection is adorable! I used a lot of them on this layout and I know I'll use the rest of the package. Yes, they're that cute! I rarely use and *entire* package of embellishments. It seems like there's always one or two pieces that I just don't work into my designs. I added our names in letter stickers to a 3x4 journaling card and machine stitched them to make sure they didn't move and to add a little bit of texture. I forgot to check whether each person was 'naughty' or 'nice' though. I'll have to make sure I do that before I add it to my album. This layout documents a silly photo we took in front of our Christmas tree. 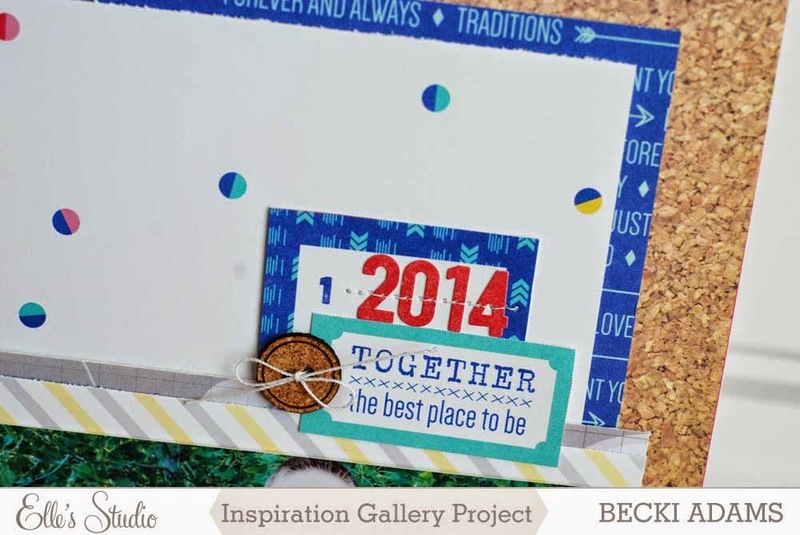 Up next is a layout I created with the Sycamore collection. This collection is so much fun because it's so versatile. I can be an Autumn collection or it can easily be used for everyday photos. I used this collection to document a photo of my kiddos and me when we were at our recent family photo shoot. 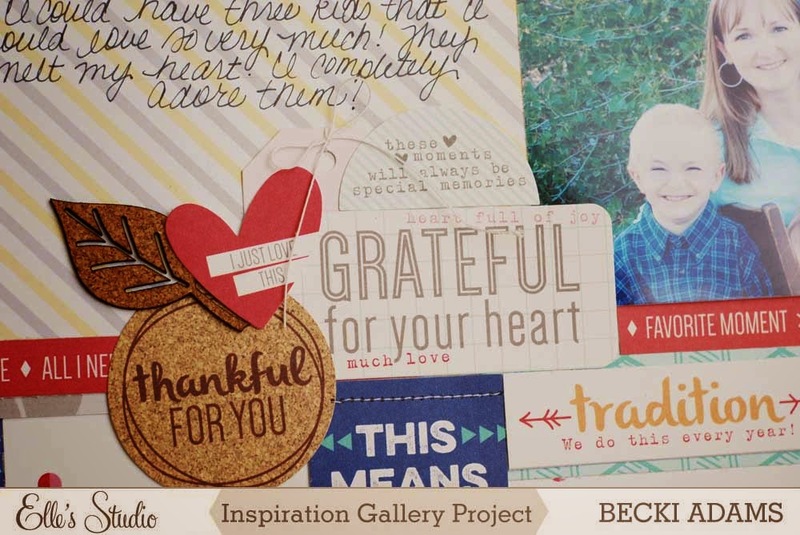 There are so many cute little bits and pieces that are about being thankful, perfect for family photos. The cork pieces that go with this collection are adorable! So cute! It's another package of embellishments that I will use every last bit of. And there you have it two projects for the Elle's Studio gallery using Elle's new collections. Have a great Monday!